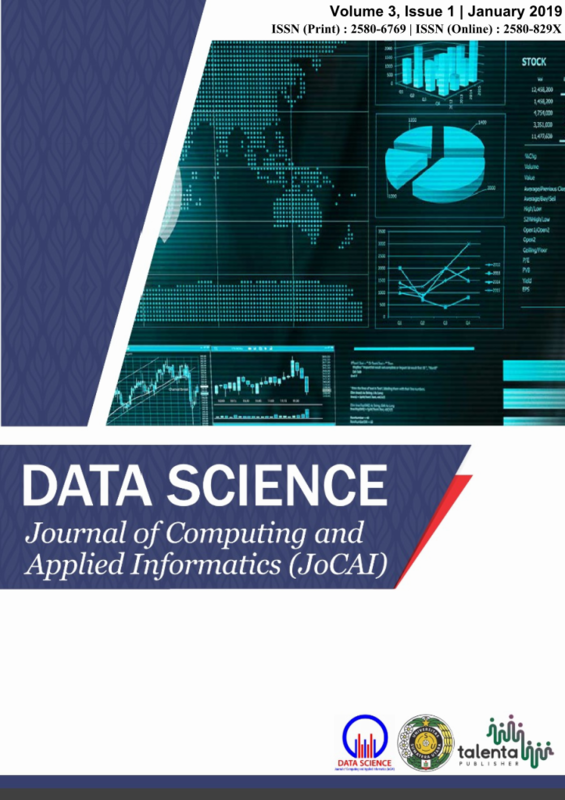 Data Science: Journal of Computing and Applied Informatics (JoCAI) is a peer-reviewed biannual journal (January and July) published by TALENTA Publisher and organized by Faculty of Computer Science and Information Technology, Universitas Sumatera Utara (USU) as an open access journal. It welcomes full research articles in the field of Computing and Applied Informatics related to Data Science from the following subject area: Analytics, Artificial Intelligence, Bioinformatics, Big Data, Computational Linguistics, Cryptography, Data Mining, Data Warehouse, E-Commerce, E-Government, E-Health, Internet of Things, Information Theory, Information Security, Machine Learning, Multimedia & Image Processing, Software Engineering, Socio Informatics, and Wireless & Mobile Computing. Each publication contains 5 (five) research articles which will be published online. These articles are indexed by Indonesian Publication Index (Garuda Portal), One Search Perpustakaan Nasional, Google Scholar, PKP Indexing, BASE (Bielefeld Academic Search Engine), CiteFactor (Academic Scientific Journal), CiteFactor (Academic Scientific Journals) and Directory of Research Journal Indexing (DRJI). JoCAI strives to be a means of periodic, accredited, national scientific publications or reputable international publications through printed and online publications.